Located 20 rows up from the track surface in the Earnhardt Grandstand, the "Restart Bar" derives its name from its location overlooking the NASCAR restart zone on the track's frontstretch. 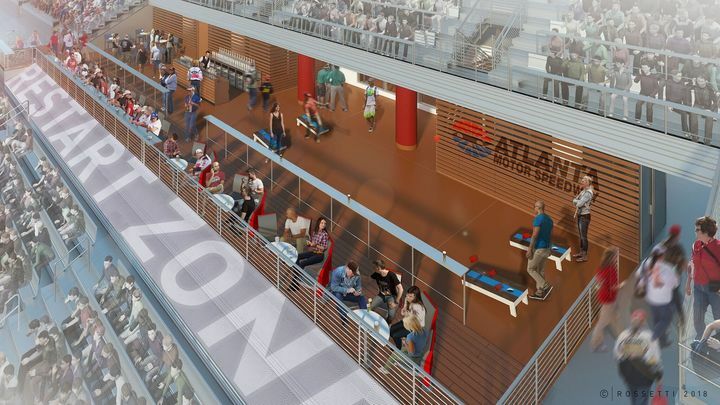 The Restart Bar will be completed in time for next month's Folds of Honor QuikTrip 500 NASCAR weekend and will deliver not only a more interactive space during all track events, but a whole new take on event entertainment as the facility continues to explore ways to better serve the needs of its patrons. "Our goal at Atlanta Motor Speedway is to provide a winning experience to every customer, every time," said AMS President Ed Clark. "The Restart Bar provides a thrilling new option for our patrons to make their attendance at Speedway events extremely memorable."